Display beautiful arrangements of small air plants and other decorative items with this clear glass ball. 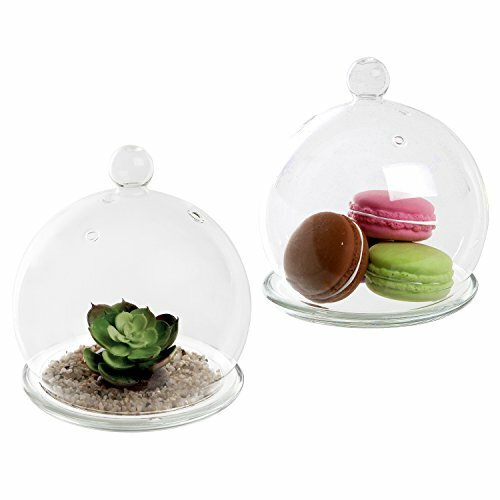 Featuring a glass globe and a saucer beneath that holds whatever arrangement you create, this small glass terrarium makes a beautiful decorative accent or centerpiece for your dining room, living room, or bathroom. To add the perfect touch of elegance to any space, simply make this beautiful glass ornament a part of your home today. Approximate Dimensions: 5.75" H X 5.25" in diameter. Beautiful glass globe and saucer design with small holes in the glass globe allow air to flow through. Creative way for displaying air plants, serving butter, horderves, or party flavors. Beautiful decorative accent or center piece in any rooms and parties, and great gift ideas for any occasion. Approximate Dimensions (in inches): 5.75 H X 5.25 in diameter.